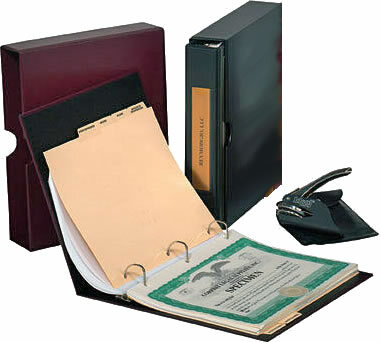 The Short Form Corporation Kit combines 20 stock certificates and 20 stub sheets, stock and transfer ledger and minutes into one handsome binder with slip case. Included is a chrome plated seal in snap pouch. These outfits require no more area than a law book and will fit neatly in a bookcase or shelf. We can customize outfits for LLCs, Non-Profit Corporations and Membership Organizations.